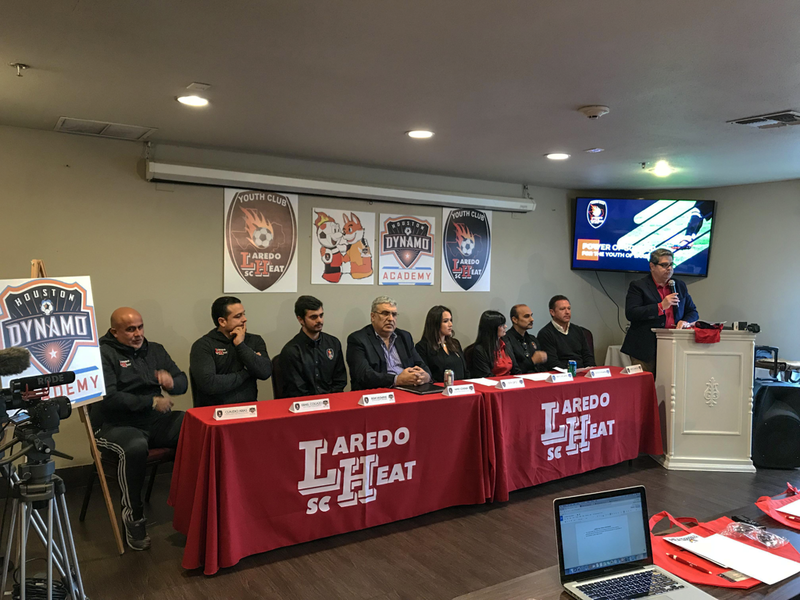 Laredo, TX (Wednesday, February 7, 2018): The Laredo Heat Youth Soccer Club and Academy held a Press Conference today at the La Quinta Inn and Suites – Laredo Airport to announce a strategic partnership with the Houston Dynamo Youth Academy. In front of local media, club supporters and local city officials, both youth organization signed a working protocol that involved technical cooperation between the youth clubs with the goal of the agreement being the Dynamo Youth Academy and the Laredo Heat set-up youth teams in the age groups of Boys Under 12 (2007), Boys Under 13 (2006) and Boys Under 14/15 (2005/2004) to begin play within the South Texas Youth Soccer Association (STYSA) competitive system. In addition, the Houston based club will be utilizing the Laredo Heat as a talent resource for youth players and will help and guide coaches within the organization in the development of yearly training plans for specific age groups, assist local coaches in developing their skills by coming to Laredo once a quarter for three days and hosting the Heat coaches at their headquarters at designated times during the year as well as having their youth coaching staff scout potential players to be recruited by the Dynamo. The Laredo Heat Youth Soccer Club and Academy in return will scout for the best talented and dedicated youth soccer players in the Gateway City in the mentioned age categories in a No Pay to Play System and give its best effort to offer the parents and/or guardians of any player deemed ready to move on, the chance to have their child be recruited by an organization with Major League Soccer affiliation. The initial tryout date of Saturday, April 7, 2018 was also announced at the press conference with times for each category to be announced at a later date. “This is the first step in what we are planning on being a sustainable relationship with the Dynamo Youth Academy”, said Heat Soccer Academy President Shashi Vaswani. “The immediate plan is to move forward with the citywide tryouts and get this process going so we can hit the Fall Season running”, continued Vaswani. “This is truly a unique situation for both the players and parents in Laredo that wish to have their children looked at in a professional environment and most importantly, in a system where they will not pay for coaching and only concentrate in improving their level of soccer”, concluded Vaswani. Houston Dynamo Director of Player Development, James Clarkson, who attended the press conference added, “We are looking to tap into an area that needs attention in terms of player development and also create brand recognition for our club”. Clarkson concluded, “Not only are we looking for individuals to play soccer but we are looking for young men that plan on making a commitment to themselves, their education and their community because at the end of the day, we plan on creating well rounded people that will be excellent human beings contributing to the betterment of society, this will not only be about soccer”. The Laredo Heat Youth Soccer Club and Academy is a 501 (c) (3) Non-Profit Corporation that operates in Laredo and Webb County, Texas for the sole purpose of training the youth in the area in the sport of soccer. The mission of the club is to get youngsters to learn to play soccer, get advanced players into competitive tournaments and teach these youngsters the rules of the game and the importance of proper training, exercise and doing well in school. The Laredo Heat Youth Soccer Club and Academy accepts donations to fund its mission and any interested party wishing to donate, can contact the organization at (956) 723 – 4700.